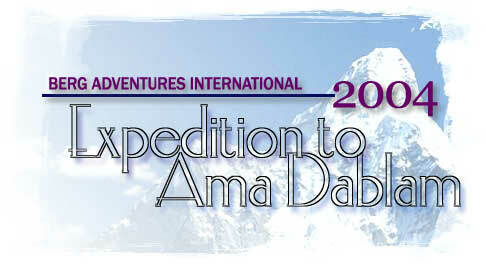 Berg Adventures International: Ama Dablam Expedition 2004. It’s November 4th and the Berg Adventures 2004 Ama Dablam team has arrived in Namche Bazaar at 11,400 ft (3475m) which his home base for us, one of our home bases in the Khumbu as we proceed with these climbs and trekking this season. We awoke today along the Dudh Koshi river after a really restful night's sleep, listening to the rushing water. A beautiful place, a great night’s sleep and everyone looked great this morning. It was a fabulous day, exceptionally clear as only it seems it can be in November here in the Khumbu. It was so clear that at the bottom of the Namche hill we actually looked up and saw Everest without a cloud in the sky. On November 4th Everest was perfectly clear. A rare sight, normally from that point it is too cloudy and you don’t see Everest, but we had an excellent view of it today. As we proceeded up the hill, Ang Temba and I ran across a legendary figure in these parts, Ang Rita the ‘Snow Leopard’. 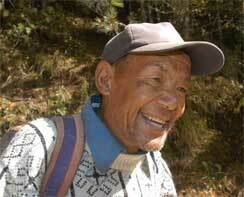 Really the first very famous climbing Sherpa of the modern era, the man who first climbed Everest 10 times. He was heading down to Kathmandu to spend the winter. He looked healthier than I have seen him look in years and we enjoyed just catching up and talking a bit on the trail before we came on in to Namche. This part of the trip is about acclimatization, seeing old friends and getting our gear sorted. We are unpacking still out of these duffel bags that have been flown around the world. Joe found a toy that his son had slipped in with the rest of his gear that he knew nothing about. It was touching for him to see a little reminder from his son from back home. 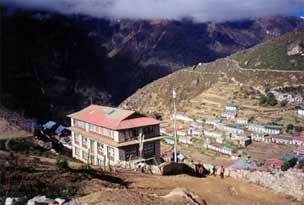 Tomorrow will be a so called rest day in Namche. Namche is always stimulating with the people we see, the shopping, the internet and of course just walking around this amphitheatre that Namche lies in. It is quite a walk down into town and back up to where we are staying at the Panorama lodge. And no doubt our morning tomorrow will begin with a trip up to the overlook to look at our objective, Ama Dablam as well as Everest and the other big peaks.